Strategic Planning for Public Relations is in its fifth edition of offering an innovative and clear approach for students looking to learn how to develop public relations campaigns. It is a text intended for those serious about entering the rapidly changing professions of public relations and strategic communication. 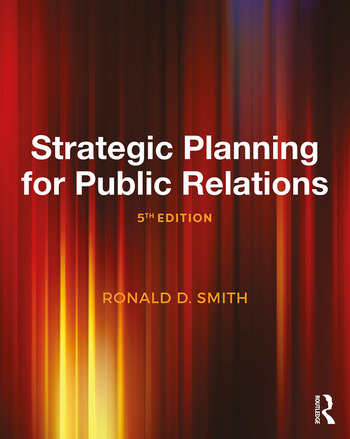 Ronald Smith shows how to implement pragmatic, research-driven strategic campaigns used in public relations practice, and draws from his years of experience as a professional in the industry and his years of teaching in the classroom. The approach used in this text is a threefold pattern: first, readers are exposed to new ideas, then see them in use, before finally being showed how to apply those ideas themselves. Complex problem-solving and decision-making processes in strategic communication and public relations are turned into a series of easy-to-follow steps, flexible enough to be applicable to myriad situations and organizations in the real world. This new fifth edition follows the same format as previous editions and includes numerous timely and real-world examples of cases and current events, along with classic cases that stand the test of time. It includes new research on opinions and practices within the discipline and covers several recent, award-winning public relations campaigns. Ronald D. Smith is Professor Emeritus of Public Communication and former Chair of the Communication Department at Buffalo State (SUNY). He is an accredited member of the Public Relations Society of America.